Wolves sealed a first Championship win in six games as they denied Sheffield Wednesday victory before they enter the play-offs. Wednesday face Brighton at Hillsborough in the first leg on 13 May before the return at the Amex Stadium on 16 May. Wolves went ahead when Michael Turner put Matt Doherty's ball into his own net while George Saville made it 2-0 from a Doherty cross before the break. Wednesday's Lewis McGugan scored from the spot when Doherty handled late on. The result means Wolves finish the season 14th in the table, seven places down on their seventh-placed finish last term. Wednesday, who face the Seagulls in the play-offs after they drew 1-1 in the automatic promotion place decider against Middlesbrough, suffered just their second defeat in their last 10 games of the season. Turner's early own goal marked six hours and six minutes since the last goal at Molineux - an injury-time winner scored by Doherty against Bristol City on 8 March - as the hosts avoided the unenviable record of becoming the first team in Football League history to draw five consecutive home games 0-0. Wolves head coach Kenny Jackett: "A win is always important whatever situation you are in and we are delighted to get that. "Now for us it is about the summer, capitalising on the strengths that we have in the side and then addressing the quite obvious weaknesses that we have." Sheffield Wednesday head coach Carlos Carvalhal: "Brighton will be a strong opponent, like all of the teams in the play-offs, but each of the four teams has a 25% chance. "We have drawn against them both times this season in balanced games and we understand we are playing a top team but I think we are a better team now than in the past. "We have a positive environment. We will be underdogs but that can be a positive for us." Match ends, Wolverhampton Wanderers 2, Sheffield Wednesday 1. Second Half ends, Wolverhampton Wanderers 2, Sheffield Wednesday 1. Attempt saved. Vincent Sasso (Sheffield Wednesday) right footed shot from the centre of the box is saved in the centre of the goal. Attempt blocked. Jack Stobbs (Sheffield Wednesday) right footed shot from the centre of the box is blocked. Corner, Sheffield Wednesday. 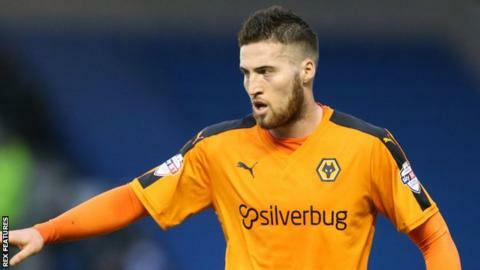 Conceded by Matt Doherty. Corner, Sheffield Wednesday. Conceded by Danny Batth. Hand ball by George Saville (Wolverhampton Wanderers). Goal! Wolverhampton Wanderers 2, Sheffield Wednesday 1. Lewis McGugan (Sheffield Wednesday) converts the penalty with a right footed shot to the bottom left corner. Penalty conceded by Matt Doherty (Wolverhampton Wanderers) with a hand ball in the penalty area. Foul by Michael Turner (Sheffield Wednesday). Delay in match Lewis McGugan (Sheffield Wednesday) because of an injury. Jeremy Helan (Sheffield Wednesday) wins a free kick in the defensive half. Attempt missed. Vincent Sasso (Sheffield Wednesday) header from the centre of the box misses to the left. Assisted by Lewis McGugan with a cross following a corner. Substitution, Sheffield Wednesday. Jack Stobbs replaces Atdhe Nuhiu because of an injury. Attempt missed. Jack Price (Wolverhampton Wanderers) right footed shot from outside the box misses to the left. Assisted by Dominic Iorfa. Delay in match Atdhe Nuhiu (Sheffield Wednesday) because of an injury. Substitution, Wolverhampton Wanderers. Dave Edwards replaces Joe Mason. Attempt missed. Marco Matias (Sheffield Wednesday) right footed shot from the centre of the box misses to the left. Assisted by Liam Palmer with a cross. Offside, Sheffield Wednesday. Aiden McGeady tries a through ball, but Atdhe Nuhiu is caught offside. Marco Matias (Sheffield Wednesday) wins a free kick in the attacking half. Attempt missed. Liam Palmer (Sheffield Wednesday) right footed shot from the right side of the box is close, but misses the top left corner. Assisted by Lucas João. Attempt blocked. Aiden McGeady (Sheffield Wednesday) left footed shot from outside the box is blocked. Assisted by Lucas João. Attempt missed. Kortney Hause (Wolverhampton Wanderers) header from the centre of the box misses to the left. Assisted by George Saville with a cross following a corner. Corner, Wolverhampton Wanderers. Conceded by Michael Turner. Dominic Iorfa (Wolverhampton Wanderers) wins a free kick on the right wing. George Saville (Wolverhampton Wanderers) wins a free kick in the attacking half. Attempt missed. Atdhe Nuhiu (Sheffield Wednesday) header from the centre of the box misses to the left. Assisted by Lucas João with a cross.